I spoke once to the idea that Walt Disney and Norman Rockwell had, more than any other creative influences, virtually defined America in the mid-to-late twentieth century. The idea is not original with me—and is not even terribly deep—but it still rings true. People tend to respond to incident and stimulus pretty much in accordance with their own self-image, and I’ve little doubt that everyone in my third-grade classroom in Bogalusa, Louisiana sat fully prepared to dispatch dear old Bowser at a moment’s notice should the specter of the deadly “hydrophoby” ever rear its hideous head. I am equally sure that Old Yeller had everything to do with that. Leyendecker was the Rockwell equivalent to the jazz age, and may have had an even greater influence on art in the early-to-mid twentieth century. Who can look at his ads and images without seeing the Astaires and Pigeons and Montgomery Clifts to come? Many of his Kuppenheimer spreads look like stills from elaborate musicals, but there is little doubt the Hollywood set designers were looking to him for inspiration, not the other way around. It is an interesting coincidence that both he and Rockwell painted exactly 322 covers for the Saturday Evening Post. (At first I thought someone had done some lazy editing at the old encyclopedia, but I was able to confirm independently through the Post that it is so. What are the odds?) Leyendecker was a mentor and inspiration to Rockwell, but they were very different personalities with very different tastes which is easy to detect looking at their material. 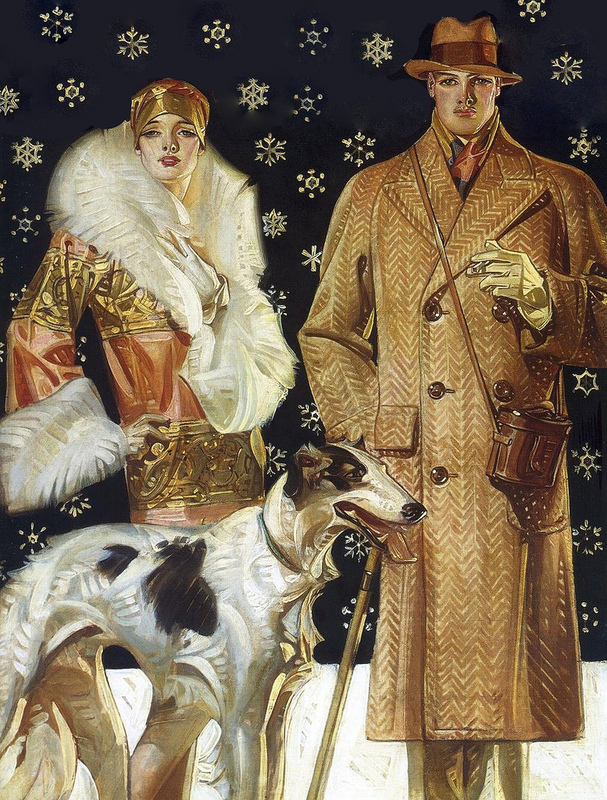 In modern terms, Leyendecker was a one-percenter and Rockwell, he’s the old Occupy Wall Street rabble. Leyendecker was all merchant, sell the shirts, the sporting equipment, the armagnac and chubby cigars. Rockwell was more into themes and ideals and emotions. Yet, it is an interesting coincidence that both he and Rockwell were largely responsible for the way in which America viewed itself, and much the way the rest of the world viewed us. We were Leyendecker Americans through the first great war and right up to the crumbling of our economy. We then co-opted the myth of Rockwell Americans in the years that followed. Both these images of ourselves are myths. Both these images are also real. People who are wise in the singular can become damned fools in the plural; people who struggle in their loneliness with a natural tendency for meanness and venality can become ennobled when working in concert with others for a cause. It is an interesting coincidence that these can be the exact same people. This entry was posted in Fine Art, The Automat and tagged Bill Perry, Dennis Kucinich, J.C. Leyendecker, Norman Rockwell, Walt Disney. Bookmark the permalink. It’s so nice to read a fan of Leyendecker’s whose brush strokes are a work of art in themselves. His mother and child portraits are among if not in the lead of the most sensitive, respectful, and life affirming! He was kind to people in his portraits (of course he portrayed only beautiful people); nevertheless it seems he could have rendered even the homliest person beautiful, whereas Rockwell, for all his high ideals and folksy patriotism, rendered good, holy people with a glaring fluorescent harshness, emphasizing unattractive features and conveying a highly judgemental superiority unbecoming to a portrait artist, a kind of cruelty toward the very obliging people who humbly posed for the great artist. His folksy charm smacks of ridicule via exaggerated realism of less than perfect features, and simplification of the complex and hard won character of the genuine Americans who provided themselves for the great Rockwell to paint. He’s much kinder to himself in his self portraits then he was to any of his subjects. In Leyendecker’s impeccable and diligent workmanship, one senses a nonjudgemental artist, interested in selling a product of clurse but also interested in inspiring and sharing his obsevation if beautiful life, whereas Rockwell, despite his disciplined work ethic exhibits a judgemental spitefulness for no cause or purpose that detracts from the noble ideas he aims to inspire. Such arrogance and petty meaness for me mars all but a few paintings, namely the four freedoms and a few others in my estimation. I greatly admired Rockwell until I “met” Leyendecker, and even more impressive the truly humble and vigorous Harvey Dunn who pays homage with his paintbrush to America and Americans. Then there’ s the master if all, the extraordinary, exhuberant, reverent, generous and humble N. C. Wyeth (was there anything he could not paint or any subtlety he could not convey? ), the elegant and spiritual Sargent, gifted and stunning Klimt (not American, but a life painter of extraordinary value) and the gentle and honest Winslow Homer and last but not least talented and modest Remington. It’s good to live in America and be allowed artistic freedom and speech. 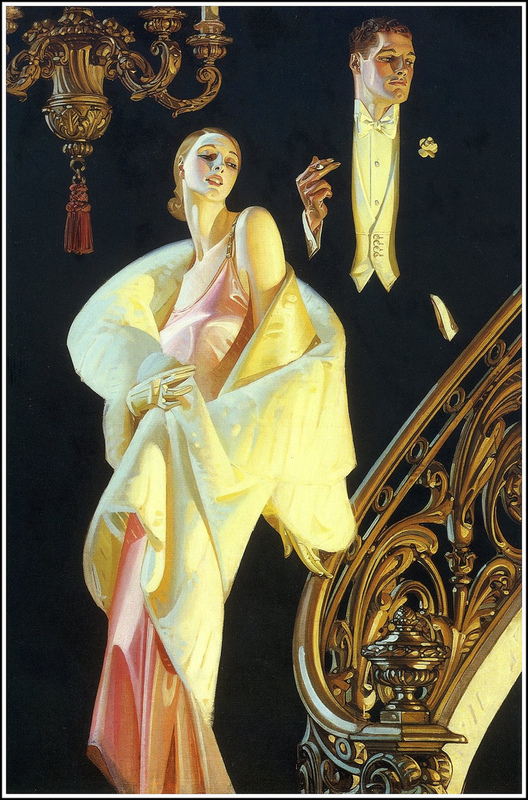 In short, I just love Leyendecker. Thank you for sharing his work and your ideas.